Looking for a simple vegan breakfast burrito to make at home? Try this one. This completely egg-free, dairy-free and vegan breakfast burrito combines tofu with some sauteed onions, garlic, mushrooms and tomatoes and spicy tabasco sauce for a healthy meal to start the day. You've got plenty of protein from the tofu, and plenty of veggies to fill you up with fiber, so this easy vegan breakfast burrito recipe makes for a quick and nutritious vegetarian and vegan breakfast idea. Top it all of with some non-dairy vegan sour cream and vegan cheese, if you have some on hand, or, add in some salsa or guacamole if you'd like. Like making vegetarian and vegan breakfast burritos? 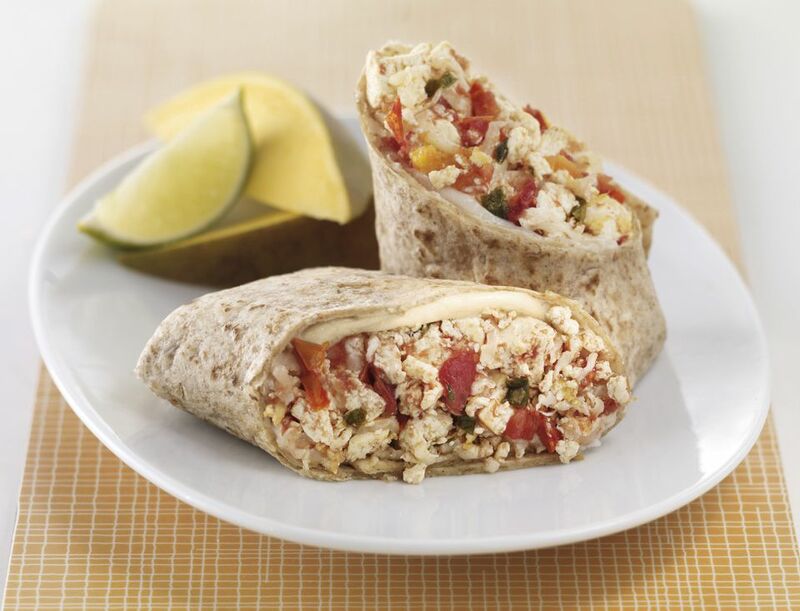 You might also want to try this vegetarian, egg and bean breakfast burrito or this basic vegetarian breakfast burrito recipe with eggs. If you're not sure what a vegan is, you'll want to check out this simple vegan definition here, and if you're looking for more vegan recipes, you'll find plenty of vegan recipes here. Warm flour tortillas over stove or in microwave until heated and soft. In a large skillet or frying pan, sautee the garlic and onion in the vegetable oil for a minute or two, then add the diced tofu, mushrooms and tomatoes and cook, stirring frequently, for about 4-6 minutes, or until the mushrooms are soft and cooked. Remove the pan from heat. Mix in the turmeric and a few dashes of Tabasco sauce, then season generously with salt and pepper, to taste. Place a couple spoonfuls of the tofu and vegetable mixture in each flour tortilla. Top with vegan sour cream and vegan cheese if desired, then wrap up your burritos and serve hot. You may find that you have enough tofu and veggies to make more than four burritos worth, depending on how full you make them. To wrap your burritos, place a layer of filling in a horizontal row just below the center of the tortilla, leaving about 2 inches on the ends. Then, fold those ends (the right and left sides) in, and then roll the burrito up away from you. Fool Your Friends With This All Vegan "Bacon and Eggs"